I think it's been less than a year, but a while back Stone Ridge Creamery invaded the freezer section of our local Shaw's Supermarkets. With its low price, I assumed it was an entry level brand and didn't pay it much attention. Well, it was on sale this week, so I decided to give it a try. I decided to go with the "Special Edition" Black Raspberry Chip ice cream. I know, I said I would avoid chocolate chips in my black raspberry, but this is different. 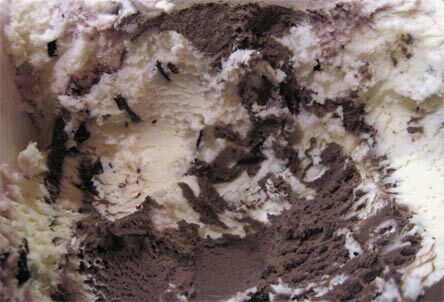 The black raspberry is mixed with vanilla ice cream. Sounds tempting, especially when you are really hungry. After throwing dinner in the oven, I decided it was time for an 'appetizer'. I took off the lid and scraped it off (don't want to waste). Hmm, interesting, it has potential. I dig in to the main container and take several bites before I really settle on how I feel about it. The vanilla is alright, it's mild, but the texture is nice. The black raspberry is strong, in fact, it feels like a sherbet. It says ice cream, but it's very debatable. I just don't like it by itself. I think the secret is to scoop the vanilla and the black raspberry in a ratio that's right for you. I bet this could actually be used to make a really nice black raspberry milkshake. Ok, so, do I like it? ....well, ummm, I guess I do. How about this, the quality is better than "Great Value" or Hood. 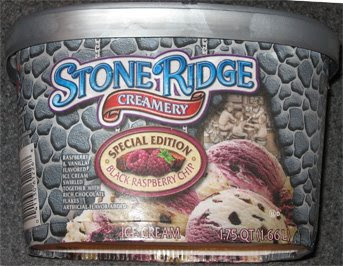 I can definitely see myself trying one of the other Stone Ridge flavors. Stone Ridge is owned by SuperValu, which owns a bunch of supermarkets ...including Shaws. Well, it all makes sense now. On Second Scoop: Well, my opinion hasn't changed a whole lot really. It's an alright ice cream. The black raspberry is just way too strong, especially if you make the mistake of taking too big a bite of it. It actually kind of reminds me of Breyer's take on black raspberry, but that's not really a good thing. I forgot to mention the chips: the are fairly scattered so they don't really bother me. They aren't real high quality or anything, so they basically just add a bit of crunch now and then.